Lexmark T640 MICR Toner - 64015HA, 64035HA, 64004HA MICR - Print your own checks with our modified Lexmark T642, T644 MICR Toner. 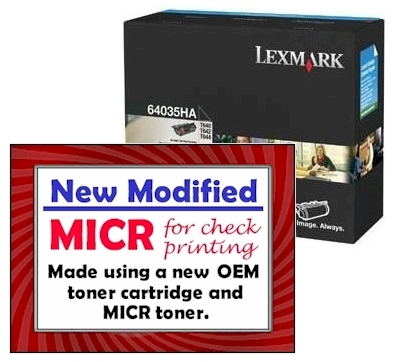 This Lexmark T640 MICR Toner is a premium modified Lexmark cartridge that delivers excellent print value. This Lexmark T642 MICR toner, Lexmark T644 MICR toner is a modified Lexmark black toner used in MICR check printing. Type: Modified Premium New Lexmark T640 T642 T644 MICR Cartridge. For use in: Lexmark T640, T640dn, T640dtn, T640n, T640tn, T642, T642dn, T642dtn, T642n, T642tn, T644, T644dn, T644dtn, T644, T644tn laser printers. 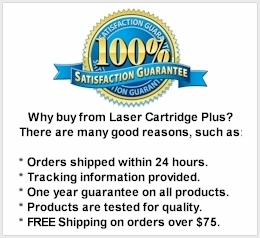 Compatible with MICR Cartridges: 64004HA, 64015HA, 64015SA, 64035HA, 64035SA, 64075HA, 64075SW, MICR-TLN-644.